за онога чија зла се једино памте. für denjenigen, der nur Missetaten hinterlässt. die Schwalben unterm Vordach sind. Desanka Maksimović (Десанка Максимовић) was born on May 16, 1898 in Rabrovica, near Valjevo. Right after her birth, the family moved to Brankovina, where Maksimović spent her childhood. She graduated from highschool in Valjevo and went on to study at the Faculty of Philosophy in Belgrade. Between 1923 and 1953 she taught Serbian at several different schools. Maksimović traveled a lot across Yugoslavia, and befriended many writers and poets such as Miloš Crnjanski, Ivo Andrić, Gustav Krklec, Isidora Sekulić, and Branko Ćopić. Her poetry speaks about love and patriotism; it is enthusiastic and youthful, yet serious and sensitive. It is said that the Serbian language is best sung in the poems of Desanka Maksimović. Some of her best poems include: Anticipation (Предосећањ), Tremble (Стрепња), Spring poem (Пролећна песма), Warning (Опомена), In storm (На бури), I seek amnesty (Тражим помиловање), Sheared meadow (Покошена ливада). Maksimović won a number of literature awards, including the Vuk Award, the Njegoš Award (1984) and the AVNOJ Award. In 1959 Desanka Maksimović was made an associate member of the Serbian Academy of Sciences and Arts (SANU). She became a regular member in 1965. 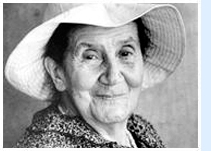 Desanka Maksimović died on February 11, 1993, in Belgrade, at the age of 95. After her death, the Desanka Maksimović Foundation was founded. This foundation organizes the Desanka Maksimović award.